A teen leader involved in the UC Cooperative Extension 4-H program in Santa Clara County was featured in a Google blog and video in honor of National Youth Science Day. In an interview with the author, Curtis Ullerich, a Google employee and 4-H alum, Reyes said she joined 4-H at five years old, and worked on 4-H baking, flower arranging, poultry, sewing and guinea pig projects. She said she learned important life skills, like public speaking and organization. 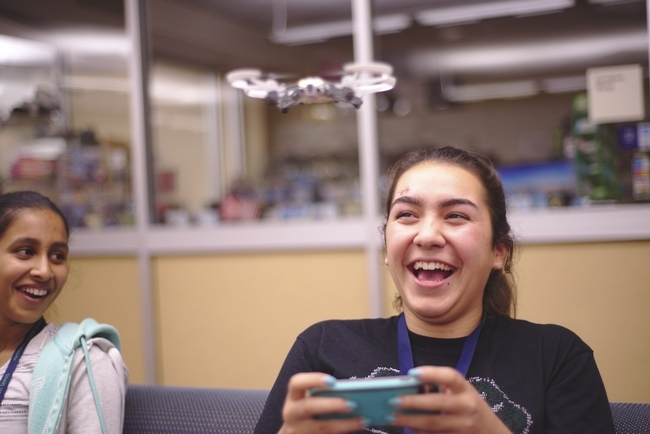 Last year, she took on a computer science project and now leads a computer science project for Santa Clara County youth. "CS is a part of so many things," Reyes said. "... CS is part of fashion, agriculture, art, music and more." Reyes became the first non-Googler to be featured in one of its CS First videos. "You're basically a celebrity now," Ullerich said. In the video, Reyes and Olga, a CS First program manager at Google, introduce a free online activity called Animate a Name. Using an online tool, kids can choose any name - their own name, a school name, a club name, etc. - and make the letters change colors, spin or dance to a favorite tune. "That was my first experience being professionally filmed and using a teleprompter, but it was very fun," Reyes said. "The final project turned out amazing. It's weird to think that kids all over the nation will be watching it as they do the Animate a Name activity."